The first thing you look for whenever you want to take a screenshot is the "Print Screen" button on your keyboard. But the problem is "Print Screen" can only take the screenshot of what is visible on your screen. So what if want to take the screenshot of an entire web page? Most webpages are big enough, you would need to scroll in order to see the full page. If you are an expert with image editing softwares like Photoshop or Gimp, you could take screenshots of portions of the page and join them together to create the complete screenshot. But this difficult, complicated and annoying. Lets see some of the easy ways to capture full page screenshots of web pages. 1. Taking full page screenshots in Firefox. The easiest and feature rich add-on that can do this magic in Firefox is the "Awsome Screenshot Plus" add-on. In addition to taking screen shots, the extra features make this add-on special. You can capture the whole page or any portion of it, annotate it with rectangles, circles, arrows, lines and text and even blur a portion of the screen before creating the screenshot image. The add-on allows you to store the screenshot on your hard-disk in PNG format. 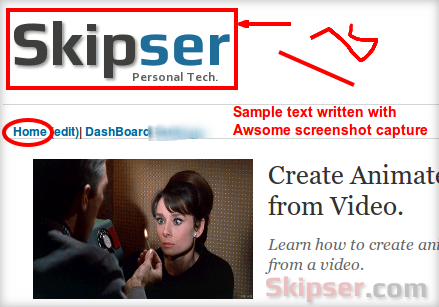 For instance, here's a partial screenshot of the Skipser home page itself taken with "Awsome Screenshot Plus". All the rectangle, ellipse, arrow, line and blurring is drawn with the add-on itself. Download Awsome Screenshot for Firefox. 2. Taking full page screenshots in Chrome. The same "Awsome Screenshot Plus" add-on is available in Google Chrome browser as well. All the functionalities including capturing the whole page or any portion of it, annotate it with rectangles, circles, arrows, lines and text and even blur a portion of the screen is available here as well. Download Awsome Screenshot for Chrome. 3. Taking page screenshots using web services. Aviary calls its screen capture tool as "Talon". It accepts a URL as input and gives you a high quality screen shot image of the full page. What makes Talon special is that you can choose the screen resolution, quality of the image and also the region of the page you want to capture. This is another simple to use tool. Just input the URL of the web page you want to capture and Snapito will show a page with the image. You can use right click on the image and use the "Save image" option of your browser to save the image to your hard disk. Site2Pic is also another similar service like Snpito where you can give a URL and it will render the screenshot image of the full page for you. Of all the web-based and add-on based methods, the browser add-ons are the best providing the best features and easiest to use. You could try the web based services if you don't want to install another add-on or when in a hurry. The web services although will work 99% of the time, you might encounter issues if the server could not contact the website you want to capture or if it could not render the fonts used by the site properly. But with the browser add-ons, what you see will be what you get. Create Animated Gif Images from Video. Google Confirms Chuck Norris Can Divide by Zero. How to See a Website Source Code in Your iPad or iPhone. How to take the full screen shot of a web page in one shot.